Yesterday I read Dan Rockwell’s Leadership Freak blog post on “Stupid Leaders Overreact” and had a bit of an epiphany. Dan talked about making big issues over small mistakes. If you have ever managed people you have to admit that you have done this and more than just once (probably way more). Dan goes further and states that the frustration that comes from small screw-ups invites overreaction. The epiphany for me came in Dan’s next statement: “Overreaction makes you choke on mosquitoes and lose sight of elephants.” Wow, how many times do we as managers do this? Be honest now, for myself I cannot count the times that I have reacted over the little issues and addressed them (hoping they would resolve the bigger problem) when in reality it does not. 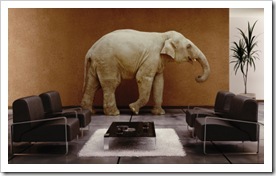 The big (elephant) issues need to be addressed before the smaller problems can be solved. Many times the big issue seems too hard to fix so we will turn our focus to the smaller problems that can be repercussions of the big issue, but seem easier to handle. Who are we fooling? We are just putting a piece of gum in the dam crack and the problem will eventually get worse (it doesn’t go away). As leaders we can become focused on the wrong issues, ones that will not fix things in the long-term. We need to remember when something goes wrong or a mistake is made it is time to ask the why questions to figure out the real issues and then address them. Do not be a leader who picks on the small issues and avoids the “elephants.” When you do this you wear your team down and never really fix the problems so that everyone can move forward. Smart leaders address all problems big and small in the a proportionate way. Try to see things as they are in the correct perspective and your work team will appreciate your efforts. Remember mosquitoes may be pesky, but elephants will make a big mess if not if not removed from the room. Get your shovel out first and then the swatter. This entry was posted on Friday, May 1st, 2015 at 8:00 am by Tina Del Buono, PMAC. Filed under Business Owner, Employee Management, Manager Topics, Medical Practice Management, office management. You can follow any responses to this entry through the RSS 2.0 feed. Both comments and pings are currently closed.